AED Outlet Exclusive! Free Responder Keychain! 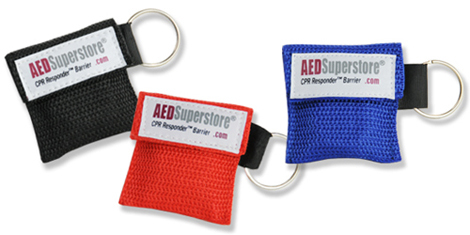 FREE Responder Keychains - Another exclusive from the AED Outlet! Now with every order you'll receive one of our bestselling keychain responder masks, a $4.99 value, FREE! These are the most portable and convenient CPR mouth barriers you'll find anywhere. They're perfect where space is limited and they're single-use and disposable. The durable one-way valve protects you from contaminants as you provide rescue breathing for someone who needs your help. To order extras for family, friends, and coworkers, just click here to add more to your shopping cart now! The AED Outlet has great prices on quantities and a choice of colors waiting for you.